The Head of Physical Productions at Capitol Pictures, Eddie Mannix (Josh Brolin), sits down with a group of religious luminaries from different faiths to get their opinion on the script for the studio’s biggest release of 1951: Hail Caesar: A Story of the Christ. When Mannix asks what they think—heavily implying he wants their expert opinion about the representation of ‘God’—one of them critiques an action beat in a chariot chase sequence as being “too fake”. 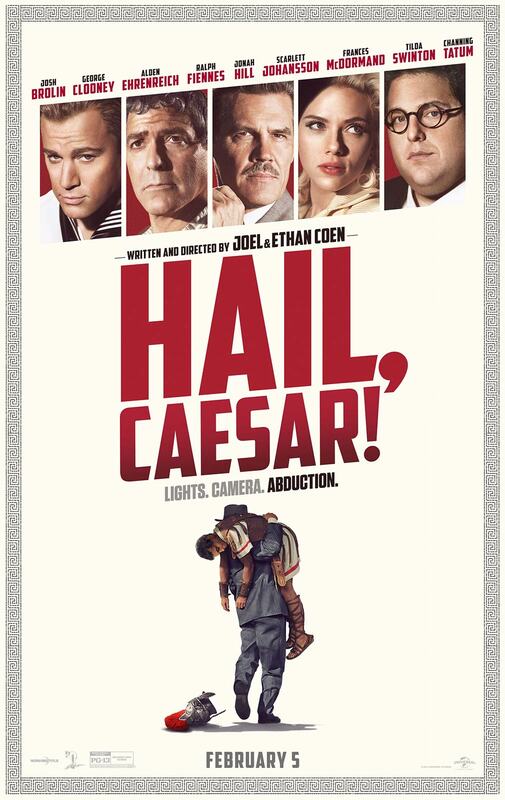 Co-writers and directors, Joel and Ethan Coen, go looking for meaning in the institution of show business—and every ‘ism’ vying for a stake of influence—with Hail, Caesar! and offer a prestigious eye-roll at the ridiculousness of it all. Mannix gets a byzantine day (a regular day for him) when the star of Capitol’s million-dollar biblical epic, Baird Whitlock (George Clooney), gets kidnapped. While negotiating Whitlock’s return, Mannix must manage a starlet (Scarlett Johansson) trying to adopt her own child for good publicity; fend off dueling gossip columnists (Tilda Swinton, playing twins) digging for dirt; and try to salvage a period drama gone awry by the southern accent of a singing Western film star (Alden Ehrenreich) going through an image change. The Coens ridicule the golden age of Hollywood and the 1950s studio system, with creative talent controlled meretriciously by their employer to be made in the image of Capitol Pictures. After a lavish, Busby Burkerley inspired synchronized swimming sequence; a disgruntled Johansson (dressed as a mermaid) throws a tantrum and tears off her costume tail with the sass of a gangster. Channing Tatum appears in a musical dance number as a campy masculine sailor singing about ‘no dames’ while they’re at sea, which goes from vaginal euphemisms to homoeroticism rapidly. Ehrenreich’s cowboy, Hobie Doyle, effortlessly performs a series of stunts to perfection, and when the clearly bored director calls ‘cut’, Doyle can’t wait to get himself a ‘big ole’ plate of beans’. Doyle is a fascinating character—one of the greatest Coen creations—a complete slave to the system but a genuinely talented performer plucked from the old world to perform for the masses—at one point he turns a piece of spaghetti into a lasso. When Doyle is assigned to ditch the chaps and don a tuxedo to star in a drama, he finds himself at odds with the director (Ralph Feinnes) over the pronunciation of a piece of dialogue that’s marred by his accent. There’s a clash of graciousness and class in this scene that quickly descends into farce and you can see Holby wishing it were over so he can get back to his ‘big ole’ plate of beans’. The Coens aren’t just pulling back the curtain on the glamour of 1950s Hollywood, they’re lampooning it with a twinge of cynicism to stress the absurdity of belief systems at war trying to infiltrate the Hollywood system, itself, a product of capitalism, that drives the narrative of Hail, Caesar!. And of course, Mannix is the good shepherd who must tend to his mad flock and sacrifice the herd to find the one gone astray. But Mannix is a perfectionist, so nobody goes haywire on his watch—literally—with each moment of the day conforming to the only certainly in the world of Hail, Caesar! : time. As the Coens wax lyrical about faith in their screenplay, time is the only reliable measure of existence. As Mannix works through his regimented day, the Coens are constantly showing his watch in a dramatic close-up to emphasise the ticking clock and show how it feels like a lifetime is jammed into 24-hours. Every second, Mannix is being tested and tempted during his exhausting day. Aside from the headaches at Capitol, the Lockheed Corporation is pursuing Mannix for a job that offers the chance to not only serve God, but to play God. A Lockheed headhunter shows Mannix a picture of the mushroom cloud caused by a hydrogen bomb detonated in the Bikini Atoll. The world is changing (like it always is in these 50s period pieces with modern weaponry) but it’s a change that foreshadows the death of the institutions Mannix believes he’s the guardian of: the wholesomeness provided by the Hollywood ‘dream factory’—good old fashioned family entertainment. Mannix sacrifices everything for this ideal; even time with his family to uphold the might of Capitol Pictures, and in a moment of irony, laments his situation while eating a reheated roast dinner on a brief visit home. You see more of Mannix’s wife (Alison Pill) and children in the photos behind his desk than you do in the scenes they share and it’s melancholic. But—and when the Coen Brothers are involved there’s always a big ‘but’—whenever there’s a moment of serious contemplation, the Coens undercut it with a gag to remind you it’s just a silly movie, or is it? Even Pill’s housewife can only offer the opinion of her husband as her own opinion in a comical ‘husband knows best’ moment in the lone, sad scene they share together. It’s an elaborate trick played by the filmmaking duo to continually subvert the quest to find a deeper meaning in Hail, Caesar! that feels like running commentary on their own careers and the search for meaning in their work. The amount of religious imagery on rotation in Hail, Caesar! 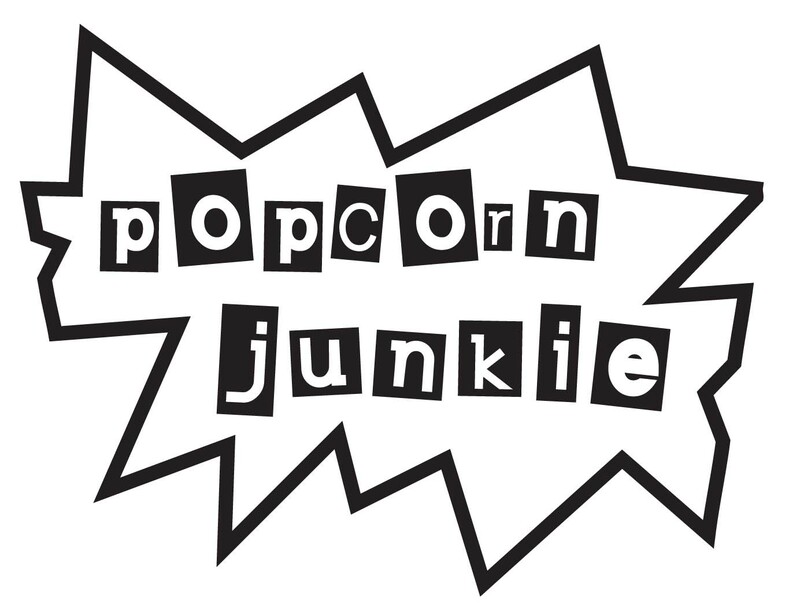 is like a blinking neon sign that sits in the window of a struggling restaurant desperate for business. Hail, Caesar! opens with the statue of Jesus bleeding on the cross in a church that’s akin to the warning on a Snickers bar that says: ‘may contain traces of nuts’. Throwing this out there from the opening is the Coens’ way of getting any subtextual ambiguity out of the way, and if anything, it’s a mark of respect for the audience that could be interpreted as snark. The Coens can be snarky, especially when it comes to their comedies, but there’s something remarkable about how they can be nonchalant about the subtext of their films while still inspiring contemplation. As this review is just about to cross the 1000 word mark it seems somewhat pointless (and maybe the joke is on me) but the underlying factor is hope. Hail. Caesar! comes to the conclusion that the as time ticks by it matters to believe in something, anything. Believe in the almighty Coen Brothers! Or don’t, we’re all in service of different kinds of crazy. Nice review, and I agree. It was a very frivolous affair.